6 MB|3 packs have been added so far. 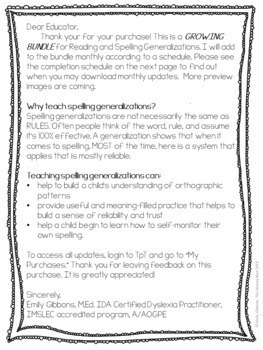 This Orton-Gillingham-based resource is a GROWING BUNDLE for teaching spelling generalizatons. Upon completion, there will be a collection of 11 packs. I will be adding 1-2 packs to the bundle per month. 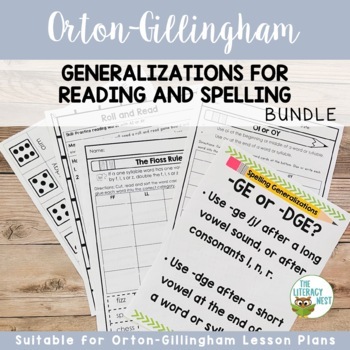 This Orton-Gillingham no-prep resource is a real time saver! It is compatible with Orton-Gillingham lesson plans and dyslexia intervention and other reading intervention programs. 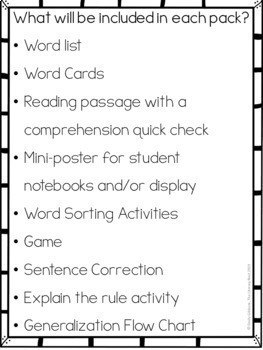 If you are an Orton-Gillingham tutor or teacher, these work well with your lesson plans! PLEASE DOWNLOAD THE PREVIEW FIRST BEFORE PURCHASING. This GROWING BUNDLE will be $29 when it is completed. If you purchased each pack separately in this bundle, it would cost you about $40. Since this is a growing bundle, there is a special discounted price of $17.50. Each month, the price will increase until it reaches a final price of $29. Purchasers are buying with the understanding that passages will be added over time. The bundle will be completed by September 30, 2019. **Please see the completion schedule in the preview or the thumbnail images to find out when you may download updates. 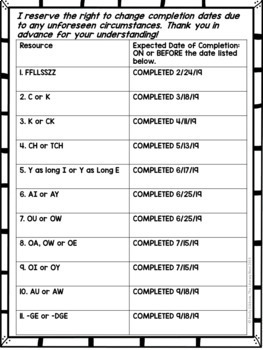 I reserve the right to change any dates on the completion chart due to any unforeseen circumstances. Why would I want to purchase a bundle that is incomplete? Some people like to take advantage of the discounted price before it increases. If you have used my materials before, you know and trust that they match O. G. lesson plans very well. Growing bundles help me organize my creation time for you. I test my materials with my own students and they love them! 3 packs have been added so far.